Wherever people and large carnivores coexist, conflicts between the two are usually inevitable. Traditionally, tiger-human conflicts in Russia were resolved by simply killing the tiger, and cumulatively such deaths represented a significant mortality factor. Human-tiger conflicts generally fall into two categories: attacks on people and predation on domestic animals. Tigers that attack people are considered problem tigers unless they are defending cubs or themselves. In most instances, tigers that have attacked people in Russia have been previously wounded in botched poaching attempts and either attack the poacher or some unlucky person who just happens to bump into the wounded cat. Tigers that prey on domestic animals are considered a problem if they do so very close to human habitations. That is, a tiger that kills a cow that wanders a kilometer into the woods unattended is not considered a problem, but one that kills cows in barnyards requires management. that most conflict tigers have previously been wounded in encounters with people. WCS has worked with government tiger-human conflict response teams since 1999, lending our expertise and qualified personnel to resolve human-tiger conflicts in ways more favorable to both tigers and people. The resolution techniques we have developed include scare tactics, negative conditioning and capturing tigers to assess their condition. Tigers in good condition that have not presented a threat to human life may be released on site or in a new area far from human settlements. Photo by Dale Miquelle, WCS. WCS is able to assess the effectiveness of our interventions, because all problem tigers that are captured and subsequently released are equipped with radio collars and regularly monitored. Together with the Russian government, we have conducted the first successful rehabilitations and translocations of wild Amur tigers in the Russian Far East. Since 1999, WCS has also provided training for government employees responding to conflict situations. Today our focus is on not only improving local expertise in wildlife immobilization, capture, and handling – skills necessary for managing tiger-human conflicts – but also developing a core group of professional veterinarians capable of addressing issues of wildlife health and disease in the Russian Far East. 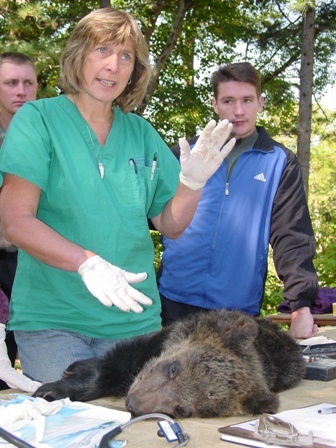 Each year we organize a 10-day workshop for government response team members, local veterinarians, and veterinary students that provides participants with knowledge of and hands-on experience using the variety of methods available for managing wildlife health issues.